Jonathan represents clients from inception to resolution in state and federal court. Drawing on his experience in private practice and as an Assistant Prosecutor for the Hudson County Prosecutor’s Office, Jonathan offers comprehensive services to his clients before trial and appellate courts and has handled matters before the New Jersey Appellate Division and the United States Court of Appeals for the Third Circuit. Jonathan represents clients in state and federal civil rights defense matters, employment litigation defense matters, public entity litigation defense matters, complex commercial litigation matters, election law matters, prerogative writ matters, and state and federal criminal defense matters. In addition, along with Victor Afanador, Esq., Jonathan serves as the attorney for the City of Hoboken Rent Leveling Board. Jonathan is fluent in Spanish. 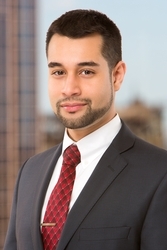 Prior to joining Lite DePalma Greenberg, Jonathan held the position of Assistant Prosecutor at the Hudson County Prosecutor’s office in Jersey City, New Jersey. While in law school, he served as a judicial extern for the Honorable Michael B. Kaplan of the U.S. Bankruptcy Court for the District of New Jersey and served as a legal intern at the Essex County Prosecutor’s Office. As a student attorney for the Rutgers Urban Legal Clinic, Jonathan provided pro bono legal services to underrepresented populations. He was also part of the editorial staff of the Rutgers Business Law Journal. Jonathan is active in serving the community. Since 2013, he has taught as an Adjunct Professor at Hudson County Community College. In 2016, he co-founded Manenas Kids, a non-profit organization with a mission to expand and improve educational opportunities and experiences for disadvantaged children in El Salvador and the Dominican Republic. He is a member of the New Jersey State Bar Association, The Association of the Federal Bar of the State of New Jersey and the Hispanic Bar Association of New Jersey. The kitchen sink approach to pleading causes of action against public entity defendants in federal court is unwise, to say the least. In an attempt to maximize the number of claims they can assert against defendants, plaintiffs often choose to plead claims against defendants in their official and individual capacities. This is especially true in cases against municipalities, where plaintiffs bring claims against high-ranking municipal officials in tandem with claims against the municipality itself. The New Jersey Tort Claims Act, N.J.S.A. 59:1-1 et seq. (hereinafter "NJTCA"), affords municipalities a myriad of immunities and defenses that shield public entities from liability. In personal injury cases that involve a dangerous condition on public property, plaintiffs sometimes choose not to sue public entities and never comply with the notice requirements of the NJTCA. In these cases, defendants often file third-party complaints against public entities for contribution or indemnification. Although N.J.S.A. § 59:8-8 requires that a claimant present the public entity with notice of the cause of action no later than 90 days after the accrual of the cause of action, defendants/third-party plaintiffs often avoid the notice requirement and file third-party complaints against public entities well after the 90 day period elapsed. In practice, defendants/third-party plaintiffs often have no knowledge that a claim for contribution or indemnification exists against a public entity until after commencement of the underlying case and the exchange of discovery. Discovery is often riddled with pitfalls, risk, and exposure for clients. Parties to litigation often request sensitive or embarrassing documents or information beyond the proper scope of discovery. While a party is allowed to cast a wide net when requesting discovery, discovery is not unlimited. The New Jersey Rules of Court, like the Federal Rules, are designed to prevent fishing expeditions. Discovery should be tailored to the issues involved in the particular case and must be relevant to the allegations of plaintiff's complaint. The Conscientious Employee Protection Act (CEPA), N.J.S.A. 34-19-1 et seq., is designed to protect whistleblowers who disclose employer or co-worker activities that pose a threat of public harm. The offensive activity must be more than a harm that only affects the aggrieved employee. See Mehlman v. Mobil Oil Corp., 153 N.J. 163, 188 (1998). Should Risk-Assessment Technology Be Part Of Our Criminal Justice System? The age-old adage that nothing is certain in life but death and taxes seems ready for an update. The persistence of the digital revolution is proving to be another of life's inevitabilities. The digital revolution has proven to be an unstoppable tidal wave of "advancement" that wipes out people and industries that are unwilling or unable to adapt. Unsurprisingly, the legal industry has had to adapt to survive in the digital world, but now, the digitization of the criminal justice system is calling into question whether technological "advancement" equals "progress." Across the country the criminal justice system is becoming automatized. Many states have started using algorithms to help determine sentencing, parole, and bail. These algorithms asses a defendant's risk of recidivism or risks of jumping bail by analyzing data about a given defendant. "Is Speech Really Free? It depends." Despite what many Americans believe, the United States Supreme Court has consistently said that the First Amendment does not give citizens unfettered freedom of speech. As the Supreme Court held in Heffron v. Int'l Soc. For Krishna Consciousness, Inc., 452 U.S. 640, (1981), "[t]he First Amendment does not guarantee the right to communicate one's views at all times and places or in any manner that may be desired."